Meanwhile, place chicken in a skillet or saucepan and add enough water to cover; bring to a boil. Transfer the chicken to a cutting board. When cool enough to handle, shred into bite-size strips. Cook pasta in the boiling water until not quite tender, about 1 minute less than specified in the package directions. Add vegetables and cook until the pasta and vegetables are just tender, 1 minute more. Drain, reserving 1 cup of the cooking liquid. Rinse the pasta and vegetables with cool water to refresh. 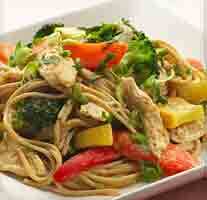 Stir the reserved cooking liquid into the peanut sauce; add the pasta, vegetables and chicken; toss well to coat. Cover and refrigerate for up to 2 days. To serve, stir in 2 tablespoons warm water per portion; serve cold or reheat in microwave. Per serving: 363 calories; 12 g fat ( 2 g sat , 0 g mono ); 44 mg cholesterol; 36 g carbohydrates; 0 g added sugars; 29 g protein; 7 g fiber; 348 mg sodium; 287 mg potassium. Nutrition Bonus: Selenium (58% daily value), Fiber (27% dv), Vitamin C (25% dv), Magnesium (19% dv). This recipe sounds both delicious and healthy. I can't wait to try it out.